The flag of corsica, the stories of the moor's head! 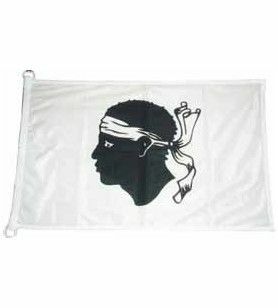 There are several stories telling us about the origin of the moor's head symbol of the flag corsica. The General Pascal Paoli, an emblematic figure, general-in-chief of the nation, and general of the kingdom of corsica, is at the origin of this flag. It is said by ancient Corsica in 1755, Pascal Paoli was the victim during a visit to the island an assassination attempt. 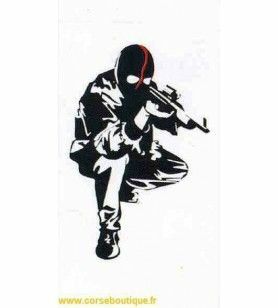 He was saved by one of these slaves, calling him "the Moor"; interposing itself between the general and the assassin he will die of a stroke corsican knife. 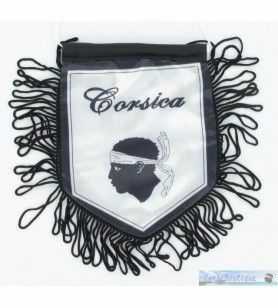 And it is as well as the General Pascal Paoli, and was declared, in a tribute to his courage, the emblem of Corsica is the head of "Moorish" dressed in a bandana on the forehead. He added that the slaves do not sleep with the bandana on the eyes. It is also said in some villages in Corsica that this flag was created to indicate the occupation of a village by the invaders. Another legend wants that, after having beheaded their enemies, the Moor's head is the symbol of the victory corsica on their opponents in order to discourage them. 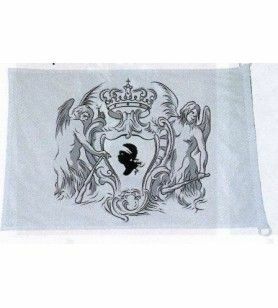 What is sure, is that no story or legend could not be verified, the origin of the flag corsica will keep its share of mystery! You will find all of our flags, corsican, below, is a symbol of strength and pride! Join us on Facebook to find the latest news, events, and share with a community in love with Corsica! Flag Corsica There are 9 products.